The Moon enters entirely into sensor, so no need to do mosaic. Very easy to shot the moon and no need to use even my computer. But since i received my new camera ASI224MC, the idea to use it for a full moon never quit my mind. But there is a difference compared to shooting using the DSLR : The full moon didn’t doesn’t enter entirely into the sensor. Even i don’t use a Barlow lens, the ASI224MC with its small sensor and small pixel size (3.75µm) mounted on a Skywatcher 150/750 will only record a small part of the Moon. 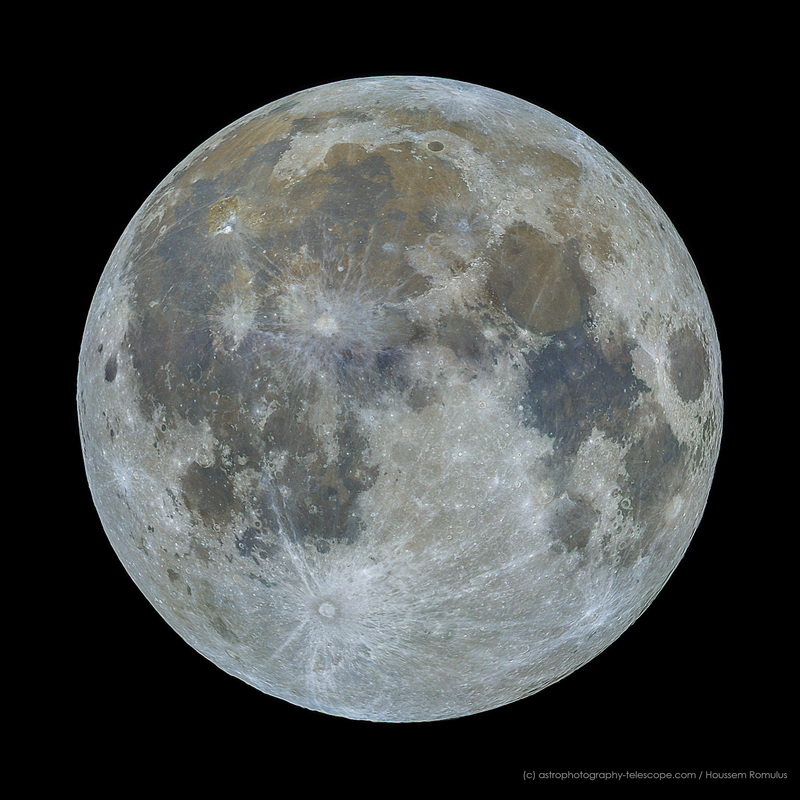 So the solution is to take separately the different parts of the Full Moon then stitch them in a sperate software. In my case i had to take 6 different panels (in video format) using the excellent software Firecapture. Then each video was processed in Autostakkert . I kept 1500 frames on the total 5000 frames captured at about 150 fps! The next step was to stitch the different parts together. And for this i used the software Kolor Autopano. It did this step automatically and easily. After that the full image was processed in Registax 6 to reveal details thanks to its powerful algorithm for Wavelets. Finally, in Adobe Lightroom, i enhanced sturation and vibrance to show the different chemical composition of the Moon specially in the Mare areas (variations of iron and titanium). .
Astrophotography Telescope © 2019. All Rights Reserved.